Al-Qaeda leader Osama Bin Laden, who was killed in a US-led operation on Sunday, traveled a long path from a university-educated strict Muslim to an infamous terrorist. Born in March 1957 in Riyadh, Saudi Arabia, Osama bin Laden was one of more than 50 children of a wealthy construction magnate, Muhammad Awad bin Laden, who started as an illiterate immigrant laborer from Yemen who turned his construction business into a worldwide conglomerate. As a result, Osama bin Laden belonged to Saudi Arabia's second richest family, with members of his extended family living and working in the US. Osama reportedly received a degree from King Abdul-Aziz University in Jeddah – in civil engineering in 1979, or in public management in 1981. Raised as a strict Muslim, Osama was radicalized by the Soviet invasion of Afghanistan in 1979. 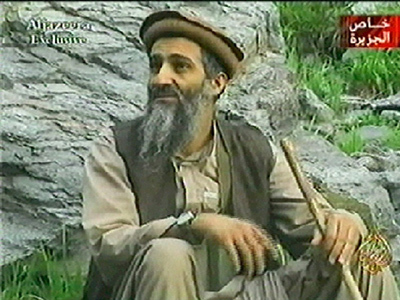 He visited the country on several occasions and collected money and supplies for the Afghan resistance, the Mujahideen. Following his graduation he left for Afghanistan, to join the Mujahideen, going on to set up “a guest house” in Peshawar, Pakistan in the mid-1980s as a first point of contact for new recruits. 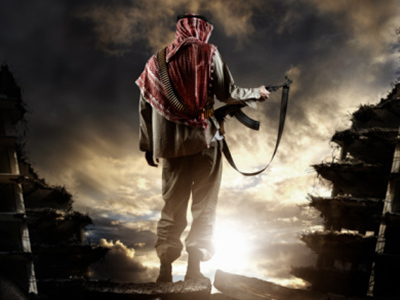 The Mujahideens’ fight against the Soviet occupation in Afghanistan was backed financially by the US and Saudi Arabia. Following the withdrawal of Soviet troops in 1989, bin Laden returned to his home country. But when the Saudis rejected his offer to defend the kingdom with an army of Mujahideen after the Iraqi invasion of Kuwait, and decided instead to invite a million US soldiers onto Saudi soil, it made bin Laden an opponent of the Saudi regime. His anti-government activities led to his expulsion in 1991, when bin Laden relocated to Sudan, He ultimately returned to Afghanistan in 1996. Later the Saudi government froze his bank accounts and stripped him of his citizenship. New attacks followed – however, this time US troops and citizens in various countries became the prime target. 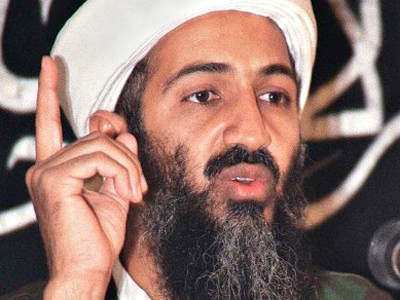 Bin Laden admitted to orchestrating some of the bombings, while some were attributed to him by US officials. There was a 1993 attack on the World Trade Center masterminded by Sheikh Omar Abdel Rahman, whose organization, the Islamic Group, was believed to have links to the Al-Qaeda network. Then came the 1998 bombings of the US embassies in Kenya and Tanzania. Two years later, in October 2000, 17 US sailors were killed when their warship, the USS Cole, was struck near the Yemeni port of Aden. Tuesday morning of September 11, 2001 propelled Osama bin Laden to infamy after hijacked planes were flown into targets in New York and Washington, reducing the 110-story World Trade Center to rubble and badly damaging the Pentagon. The US reacted with force. After failing to persuade the Taliban government in Afghanistan to hand over bin Laden, the US invaded the country. However, he was nowhere to be found. 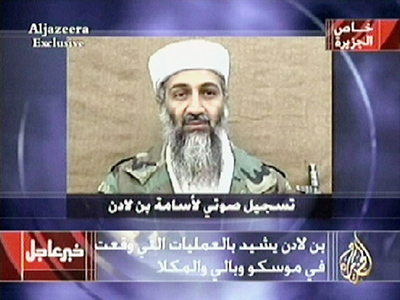 Throughout the US campaign to find him, Osama bin Laden was communicating with the world through audio and video tapes which were from time to time broadcast by the Al Jazeera news channel. In December 2004, he released an audiotape calling on Iraqis to boycott the elections and accusing Iraq's interim government of siding with the US against Muslims. He called on Muslims to oppose them as a matter of faith. Surfacing after a year’s silence, the Al-Qaeda leader dramatically inserted himself into the November 2004 US presidential race with an address to the American people. In the video tape aired by Al Jazeera days before the Americans went to the polls, bin Laden directly admitted for the first time that he ordered the September 11 attacks. He told the American people that "the best way to avoid another Manhattan" was to stop threatening Muslims' security. "Your security is not in the hands of Kerry, Bush or Al-Qaeda. Your security is in your own hands. Each state that does not attack us or harm us will be safe," he said. In January 2006, an audiotape purportedly from the fugitive Al-Qaeda leader struck a more conciliatory tone, offering the US a truce, providing it withdraws its troops from Muslim lands. But he also warned that Al-Qaeda was preparing fresh attacks on US soil. Just three months later, Al Jazeera television broadcast an audio tape purported to be from bin Laden, in which the conciliatory tone was gone and he appeared to accuse ordinary Westerners of supporting a war on Islam. On September 23, 2006, the French newspaper L'Est Republicain, citing the country’s secret services, announced that the Al-Qaeda leader had died of typhoid fever in Pakistan. Later that information was rebutted. In 2007, not long before her assassination, Pakistani Prime Minister Benazir Bhutto said that bin Laden has been killed by Ahmed Omar Saeed Sheikh, the infamous British-born militant of Pakistani descent. In November 2008, Michael Hayden, at the time the CIA director, announced that Osama bin Laden was hiding in Pakistan and no longer controlling the Al-Qaeda group on a daily basis. 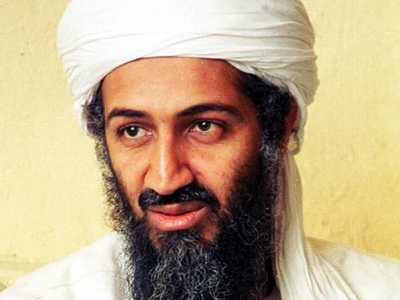 For many years the whereabouts of Osama bin Laden remained unknown. 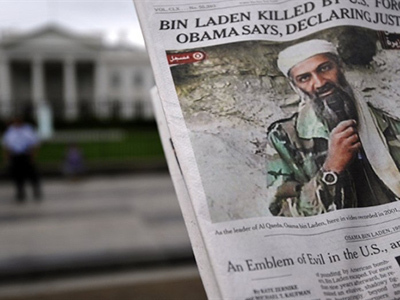 Despite the military might of the US, tracking down bin Laden proved impossible – until now.